2019 health and wellness resolution list - let's make them stick! How would you describe your job to someone in a different field / not familiar with CCQ? 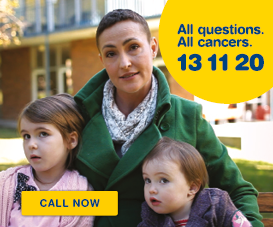 My primary role is to analyse and report on data that is collected in the Australian Childhood Cancer Registry, which stores details on every child in the country who has been diagnosed with cancer since 1983. The purpose of my job is to give people a better understanding of these rare but significant diseases, provide information that can be used for advocacy and increasing awareness, and ultimately to improve outcomes for patients. My favourite hobby is: Going to the beach. I’ve been volunteering with the Gold Coast Disabled Surfing Association for the last couple of years and it is an amazing experience! A skill I wish I had: Ventriloquism – it could come in handy in at times, ha, ha. Guilty pleasure: I have a weakness for desserts, but I usually don’t feel too guilty about it until I get on the scales, look in the mirror or have to answer a survey from the Healthy Workplace Committee! What I enjoy most about my role at CCQ is: Having the opportunity to collaborate on a variety of research studies with some very knowledgeable and dedicated people who are great to work with and from whom I have learned a great deal over the last few years. There is always a sense of accomplishment that comes with getting our findings published. My pet hate is: I checked with our dog Monty. He said that he is not all that fond of storms. I can’t agree with him on that one – I always look forward to a bit of lightning and thunder. My hidden talent is: I’m quite good at packing things into whatever space is available. I was even complimented once by someone at airport security for my neatly arranged suitcase. If I could change careers I would: Work with animals – maybe training guide dogs or a job at Australia Zoo (preferably in the marsupial section rather than the Crocoseum). My worst habit is: Not being able to sit still – I’m very fidgety. I’m most proud of: Being part of an organisation that offers people assistance and hope during one of the most difficult periods in their lives. Best advice I ever got: Do unto others as you would have them do unto you. What three traits would you describe yourself with? If I can choose three positive traits I would say reliable, honest and generous, but I would also have to balance that out by admitting to a few negative ones as well, particularly the fact that I am impatient. Most memorable moment at CCQ: Helping to develop a comprehensive set of rules for cancer registries to assign stage at diagnosis for childhood cancers. I’m still amazed that a document developed and tested over many months right here at CCQ has been translated into several languages and is now being used throughout the world, including places such as Europe, South America and Africa. Is there someone that inspires you? People that devote themselves to serving others. Cancer Council Queensland spatial modeller Dr Susanna Cramb has been named a Superstar of STEM by Science & Technology Australia (STA). Entry into the program is highly competitive, with only 60 scientists chosen from around Australia. Dr Cramb will spend the next two years undertaking activities that aim to remove society’s gender assumptions about scientists and increase the public visibility of women in STEM. She said her experience earlier this year speaking at a girls’ maths day at the University of New Wales motivated her to apply to become a Superstar of STEM. “I really enjoyed speaking to 600 young women who are in senior high school and encouraging them to consider a career in statistics. It made me realise I have the potential to be a role model for students and could promote the importance of women in STEM,” Dr Cramb said. In addition to working within Cancer Council Queensland’s research team, Dr Cramb is an adjunct visiting fellow with QUT. 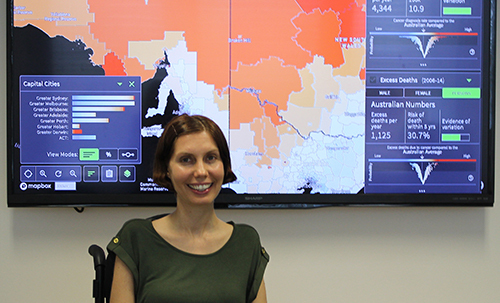 She was a key member of the team behind the recent release of an Australian Atlas of Cancer – the interactive digital cancer atlas shows national patterns in cancer incidence and survival rates based on where people live for 20 of the most common cancers in Australia. “It’s hard to see if there’s a problem in an area without getting the data and running some analyses. So we’re able to see clearly what is happening in this country when it comes to cancer, and identify where things potentially need to be improved,” Dr Cramb said. Professor Emma Johnston AO, President of Science & Technology Australia, said the 60 women announced today would no longer be hiding their scientific superpowers, and would share them with as many Australians as possible following the launch. “When we launched the program last year, I said that the stereotypical scientists was an old man in a white coat,” Professor Johnston said. For Dr Cramb, her superpower is statistics. She wants to show that in addition to her work with the Atlas of Cancer, stats can be used to make a difference in so many different areas. “Data is everywhere, but without statistics and knowing how to interpret that data, we won’t have a chance to make use of all that information. Statistics are valuable in almost any discipline, whatever someone’s interest is in, they can merge that with statistics to have an impact,” she said. Dr Cramb sees the importance of communicating her research and believes all scientists should see that as a priority. “Any scientist needs strong communications skills. If you can get your message across to audiences, that’s when they can see how amazing science is. So I am hoping to improve my communications skills through the Superstars program,” she said. With another year under way, thousands of Queenslanders have set New Year’s Resolutions for 2019. But if you haven’t it’s not too late to turn over a new leaf, we offer some New Year’s resolutions to inspire your good intentions and help make them stick! Establishing a healthy lifestyle is one of the most important things you can do to reduce your cancer risk. Last year, health and fitness topped the list for New Year’s Resolutions, and it’s great to see people are setting goals to improve their wellbeing. However, long-term change can be hard, and we know that not everyone actually achieves their resolutions. Data by comparison website Finder* showed that the top five resolutions for 2018 involved improving fitness, eating better, quitting smoking, quitting alcohol and learning a new skill. Research also shows people are more likely to reach a goal if it’s specific and attainable. As making too many changes too quickly or becoming discouraged after initial setbacks can cause people to throw in the towel and resume old unhealthy habits. 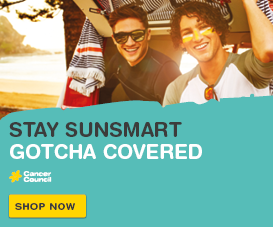 We want to keep all Queenslanders motivated to achieve their health goals, as at least one-third of all cancer cases are preventable with simple lifestyle changes, including limiting alcohol, quitting smoking, maintaining a healthy weight, eating well, keeping active and being SunSmart. One, achieve a healthy weight. Reaching and maintaining a healthy weight is good for your overall wellbeing, but we know from The Health of Queenslanders Report 2018** that this is a challenge for many Queenslanders, with two in three adults overweight and obese. For adults, a quick way to check weight status is your Body Mass Index (BMI) and waist measurement. Balancing physical activity with a nutritious diet will not only help your waistline but reduce your risk of illness and chronic disease. In 2019, establish a lifelong system of staying accountable, such as keeping a food and physical activity diary. Two, quit smoking. If you smoke, your body is constantly working to try and repair the damage done by regularly inhaling more than 7000 toxic chemicals. There are so many good reasons to quit and the sooner you do, the more you can reduce your cancer risk. Benefits include improvements to your health, your looks, your sense of taste and smell, your fitness and finances. And if someone you love smokes, encourage them to do the same, remembering that second-hand smoke can be just as lethal for you, your friends and family members. Call Quitline on 13 QUIT (13 7848) for free information, practical assistance and support to quit. Three, cut back on alcohol. Drinking alcohol can increase your risk of alcohol-related cancers and other chronic diseases. If you choose to drink alcohol, stick to the National Health and Medical Research Council guidelines for alcohol consumption of no more than two standard drinks per day. Keep in mind that many alcoholic drinks are kilojoule heavy, so cutting back on alcohol could also help with maintaining a healthier weight. Four, get up-to-date with your screening. Is there a screening test that you’ve been putting off? The New Year is the perfect time to set a date and get checked – it just might save your life. Find out about the three national screening programs for bowel cancer, breast cancer and cervical cancer at cancerscreening.gov.au. Five, get to know yourself. When it comes to cancer, in most cases the earlier it is detected, the better. This is because finding cancer early can increase the likelihood of successful treatment. Without fretting or worrying, make it another resolution to get to know the regular look and feel of your body, keep an eye out for unusual changes, and commit to seeing a GP if you notice any changes. Now you have it – your cancer resolution guide. This January, put your health first and put steps in place to learn about cancer and reduce your risk. Each year fundraisers from across the state pledge to make a difference by taking part in Cancer Council Queensland’s CancerFREE Challenge – and last month the winners were crowned! The CancerFREE Challenge rewards and acknowledges Cancer Council Queensland’s most talented fundraisers by inviting them to commit to raise $10,000 during the year and compete for the rights to name a research grant. In 2018, 72 fundraisers accepted the challenge, with the top three invited to Brisbane for the announcement of the overall State champion. Tish Henderson (left) and Carol Underwood (far right) from the Redlands Volunteer Branch with, CEO Chris McMillan. After raising over $117,000 Cancer Council’s Redlands Volunteer Branch was crowned the overall champion for the second year in a row, as well as the Highest Fundraising Branch. Senior Regional Fundraising Coordinator Sophie Williams and Joshua Ramadani. 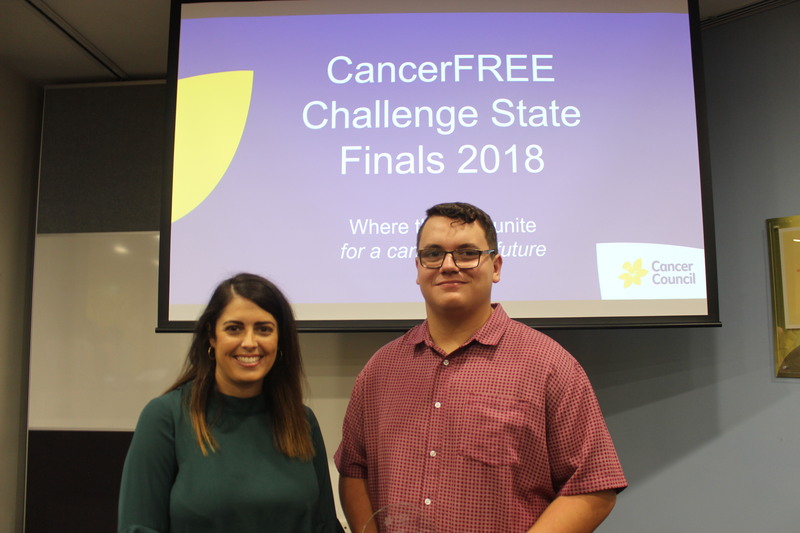 Joshua Ramadani (16) from Townsville was named the Highest Fundraising Individual and the Innisfail CancerFREE Challenge Team were named the Highest Fundraising Team. 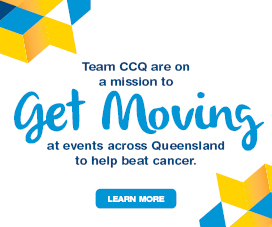 Cancer Council Queensland CEO Ms Chris McMillan said the combined efforts of CancerFREE Challenge entrants in Queensland had resulted in a fundraising total of $1.136 million. “I’m so proud to announce that our Redlands Volunteer Branch, Joshua Ramadani and the Innisfail Fundraising Team are our 2018 champions,” Ms McMillan said. “Together, our category winners raised $238,000 for the cause throughout the year, through countless events, stalls, raffles and more – a simply phenomenal effort for which we can’t thank them enough. 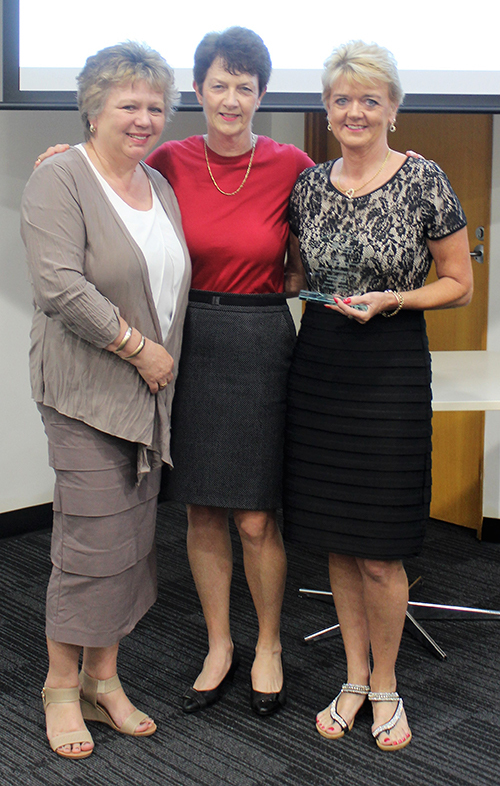 Ms McMillan said the charity was honoured to have so many dedicated fundraisers in Queensland. “Thank you to everyone who got involved in our CancerFREE Challenge this year and to everyone who showed their support through volunteering or donating – you have all played an important role in reducing the burden of cancer,” Ms McMillan said.